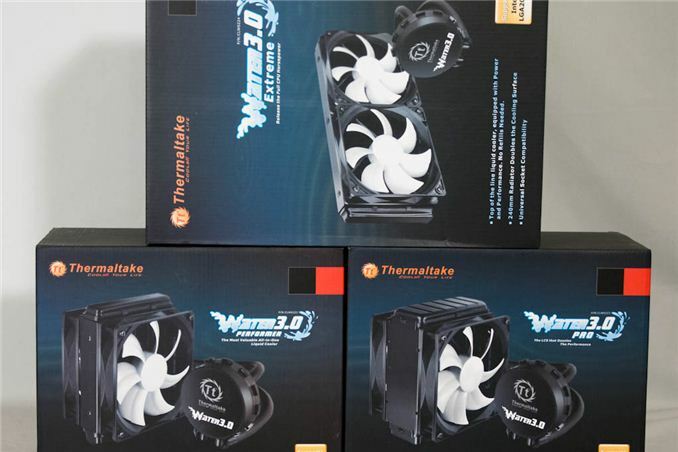 The Water 3.0 revision of Thermaltake's closed loop cooling line is, in an interesting turn of events, an opportunity for us to essentially test the stock, traditional versions of Asetek's closed loop cooler products. Companies like Corsair, NZXT, and Thermaltake (among others) will often take the existing radiator, pump, and waterblock loop and give it their own spin, either by including special software, adding fan headers, or just using higher quality fans to differentiate their products. We've been able to test the CoolIT versions of the 120mm and 240mm radiator loops thanks to Corsair, but the Asetek ones are very popular as well (and in my opinion preferable), and thankfully that's what Thermaltake opted to go with for their third series of closed loop coolers. The variety of coolers is pretty simple: you're dealing with a traditional 120mm radiator in the Water 3.0 Pro, you get a double-thick 120mm radiator with the Water 3.0 Pro, and then you go back to standard thickness and double-length with the 240mm radiator in the Water 3.0 Extreme. What's unique to Thermaltake is that each of these coolers comes with two fans. Entry level kits typically only come with one fan (see Corsair's H60, NZXT's Kraken X40), but out of the box these should perform about as well as they can thermally. As these are Asetek units, installation is handled using the same method I've detailed previously. Asetek uses a notched ring that's mounted through the mounting holes in the motherboard; from there, you line up the notches on the ring and the waterblock and slide it into place, then turn it so the notches on the ring lock the block. Twist the thumbscrews to secure the ring and you're done. It's very simple and as far as I'm concerned the easiest mounting system short of the one Cooler Master employs with their Seidon 240M. It's important to remember, though, that the majority of these closed loop coolers employ aluminum fins in the radiator instead of copper and Thermaltake's is no different. A copper radiator like the one in Swiftech's H220 feels a lot heavier, but the fins themselves are also easier to bend due to the softer material. The copper also does a better job of dissipating heat; the 240mm H220 is essentially competitive with the 280mm NZXT Kraken X60 (itself an Asetek design). Where Thermaltake diverges from the competition is that they opt to keep the packages as simple as possible. The Water 3.0 Extreme plugs into a USB 2.0 header on the motherboard and has the 4-pin PWM fan headers coming out of the block, and it benefits from software control essentially identical to what NZXT uses with the Kraken X40 and X60, suggesting even the software is a re-skinned OEM solution. That means three cooling modes: a "Silent" fan curve, an "Extreme" fan curve, and then a custom fan curve. 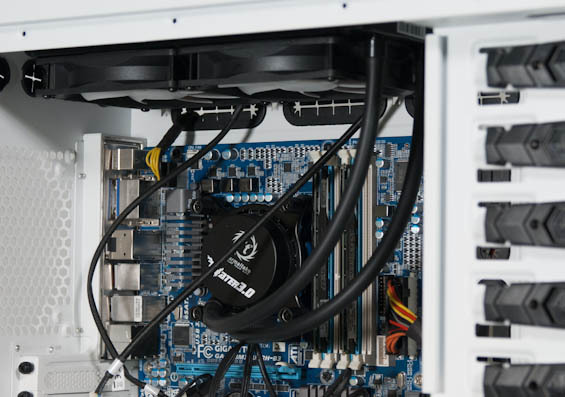 Meanwhile, the 3.0 Pro and 3.0 Performer both rely on a PWM splitter connected to the CPU fan header on the motherboard to control fan speed; you'll need to plug the pump into a separate 3-pin header. looks like i'll start a custom loop using my h100 as base and slowly work my way up to replacing everything. thanks for doing the research and work finding flow rates and how well the smaller pump supplies a real 240 rad. my plans: buy a rez, next a real rad, then get the block n pump. it'll take longer and cost more than going custom straight off but i'll still have a modded h100 when im done. Im very happy with my H100i, but i replaced the fans with 2x noctua 120mm pwn fans, and it helped alot. MUCH lower noise, and my idle and load temp dropped 3-4 C´s ontop of that.